The Artemis of Versailles, a small copy of the classical statue, lay on the mantle piece above the fireplace in the Titanic's first class lounge. The statue was one of the artefacts photographed when Dr Robert Ballard and his team revisited the wreck site in 1986. A photograph of the statue appears in the book Discovery of the Titanic. The original statue is now in the Louvre, Paris. 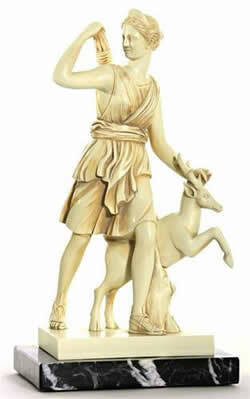 Artemis, one of the more important goddesses in Greek mythology, was the counterpart of the Roman goddess Diana. She was the daughter of the god Zeus and Leto and the twin sister of Apollo. She was chief hunter to the gods and, like Apollo, was armed with a bow and arrows, which she often used to punish mortals who angered her. She was also the goddess of childbirth, of nature, and of the harvest.